Author: Santlofer, Jonathan Set In . . .
Kate McKinnon has lived many lives, from Queens cop to Manhattan socialite, television art historian, and the woman who helped the NYPD capture the Death Artist and the Color Blind killer. But that's the past. Now, devastated by the death of her husband, Kate is attempting to quietly rebuild her life as a single woman. Gone are the Park Avenue penthouse and designer clothes. Now it's a funky Chelsea loft, downtown fashion, and even a hip new haircut as Kate plunges back into her work—writing a book about America's most celebrated artistic era, the New York School of the 1940s and '50s, a circle that included Jackson Pollock, Willem de Kooning, and Mark Rothko. But when a lunatic starts slashing the very paintings she is writing about—along with their owners—Kate is once again tapped by the NYPD. As she deciphers the evidence—cryptic images that reveal both the paintings and the people who will be the next targets—Kate is drawn into a world where art and art history provide lethal clues. 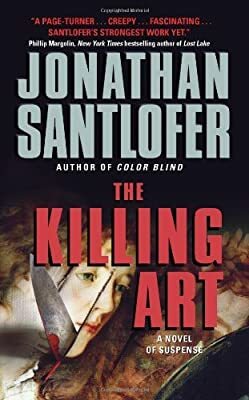 The Killing Art is Jonathan Santlofer's most gripping and chilling story yet, but that isn't the only reason the novel is remarkable. The author, who is also an acclaimed artist, has created works of art just for the book that tantalize and challenge readers by using well-known symbols in innovative ways, allowing them to decode the clues along with Kate. A masterwork of both suspense fiction and art, The Killing Art will impress both thriller readers and art fans as the plot twists and turns toward a shocking climax.